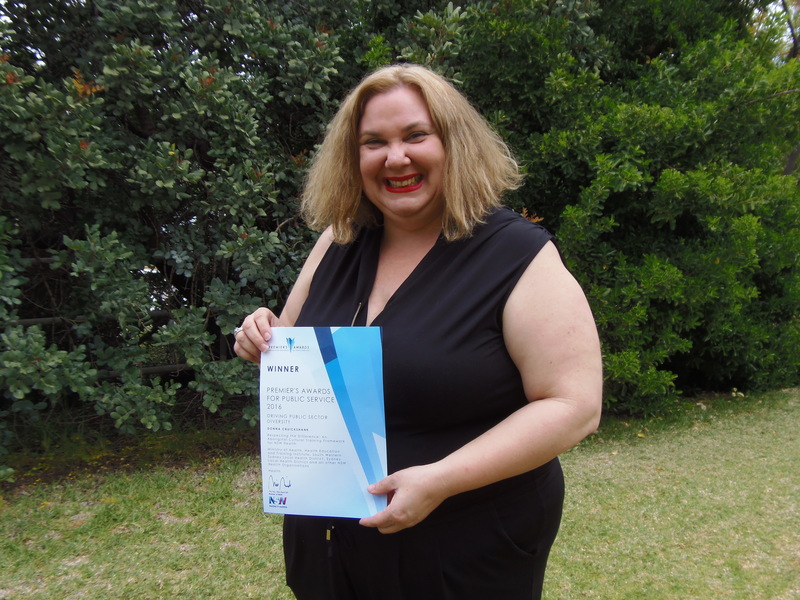 The Far West LHD congratulates Ms Donna K Cruickshank on winning a 2016 Premier’s Award for Public Service for her work in developing an Aboriginal cultural awareness program for the NSW Ministry of Health. Ms Cruickshank, FWLHD Manager Planning and Service Development, was part of the NSW Health team that worked to develop ‘Respecting the Difference: An Aboriginal Cultural Training Framework’ for NSW Health. The project won in its category “Driving Public Sector Diversity” when the Awards were announced Tuesday night at a gala event held in Sydney. Respecting the Difference (RTD) sought to address concerns that Aboriginal people were not feeling culturally safe with health services. It aimed to ensure the cultural awareness of NSW Health staff, in the belief this will impact on real change in closing the gap between Aboriginal and non-Aboriginal health outcomes. RTD was developed in collaboration with Aboriginal stakeholders and incorporates eLearning and face-to-face elements in an innovative and flexible design which supports the timely delivery of training across NSW Health’s workforce. It also incorporates Health’s 24/7 service requirements. Ms Cruickshank said it was an exciting and nervous reaction when her team was announced winners in their category. “It was very exciting and it really gave us a feeling of accomplishment and we are all very proud of Respecting the Difference,” she said. Far West LHD Chief Executive, Mr Stuart Riley, congratulated Ms Cruickshank on winning the Award with her team and for helping develop a very worthwhile project. Respecting the Difference: An Aboriginal Cultural Training Framework for NSW Health was a project involving the Ministry of Health, Health Education and Training Institute (HETI), South Western Sydney Local Health District, Sydney Local Health District and all other NSW Health Organisations.